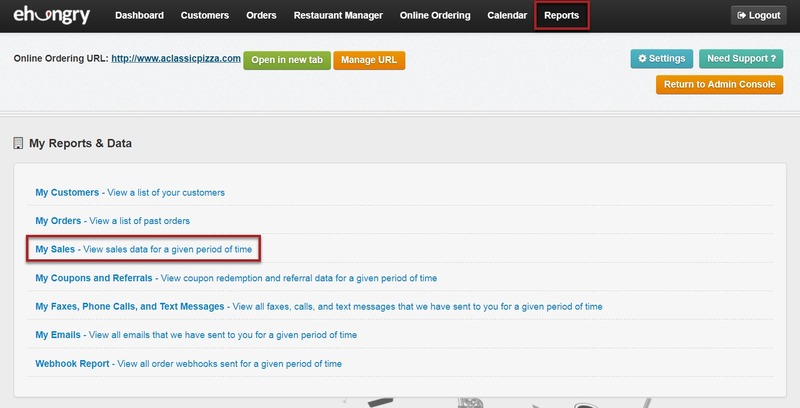 In your Online Ordering Console, you can Generate a Sales Report by selecting "Reports" from the main menu, and then selecting "My Sales - View sales data for a given period of time". Enter the date range you would like a report for. You can choose to divide the report by months or weeks. Click View This Report to generate. Sales Trend will show the total order sales and number of orders for each location. Sales by Menu Item will show the statistics for each menu item at each location. Sales by Menu Category will show the total sales for each category for all locations. You can also print or export each report to MS Excel!